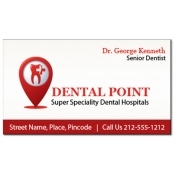 Specialty business card magnets offer great advantage to dental practices that are trying to differentiate their practice from others. Business card magnets all look the same and they feel the same. Many times, on receiving a business card, a person may think how this business is different from others. 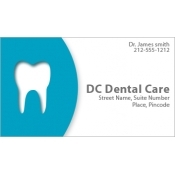 Dental practices can easily diffuse this confusion and build their difference through any of these promotional magnetic business cards. Presenting a business card is more of a common and ordinary thing to do. As usual, people are bored of seeing the same old business cards and they would trash it easily or may retain it for short time. However, this is not going to bring any business advantage to dentists. 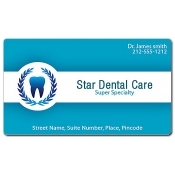 They can easily improve their visibility and gain recognition for their business by investing in these tooth shaped custom business card magnets. 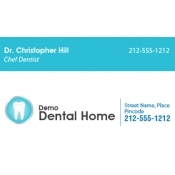 There is no restriction on time and place when dental services or businesses cannot think of giving away promotional business card magnets. There is a difference between handing out a regular business card magnet and a shaped business card because it is more of an entertainment than business. 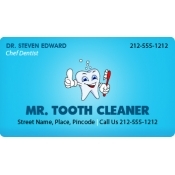 People will be happier to receive a business card which looks like their tooth and becomes an asset to their bland refrigerator door. Being made of high quality magnetic material, these custom magnets last and perform above expectations. 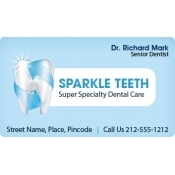 Dental services can easily improve their visibility and strike rapport with their clients by indulging in these high quality magnetic business cards. They can stock it for future use or stack it for easy carry to tradeshow venues and other mass events. We offer free art setup, free online design proof, free shipping and free full color printing which enables marketers to save and create winning campaigns. We offer great pricing benefits on wholesale orders of these promotional magnets. To know more about customization, distribution or influence of these customized refrigerator magnets, feel free to contact us at info@CMagnets.com or 855-762-4638 (Toll Free).